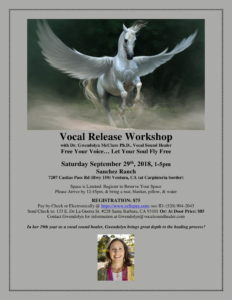 Free Your Voice…..Let Your Soul Fly Free! Please join us for a beautiful outdoor vocal sound healing afternoon Retreat at Sanchez Ranch off Casitas Pass Rd (Hwy 150) in Ventura, just on the Carpinteria border! We will make vocal sounds, draw, sing, and move to set our souls free and give love to ourselves at a deep and profound level. Gwendolyn sings songs to soothe your soul, and makes tones to pierce through density into light. Go to the next level of your Spirit’s Journey & Healing Process in this lifetime! Arrive at 12:45pm to get settled in before the workshop begins at 1pm. In her 29th year as a vocal sound healer, Gwendolyn brings great depth to the healing process! Gwendolyn wrote the first doctoral dissertation in the world on the topic of Vocal Sound Healing in 1998 at Pacifica Graduate Institute: “A Cross-Cultural Interdisciplinary Study of the Healing Power of Singing & Vocal Sounding,” which weaves together Indigenous Cultural Practices, Music Therapy, and Jungian Theory.